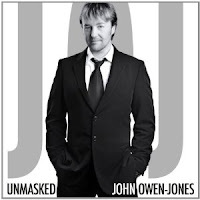 He is currently starring as the Phantom in the tour of Phantom of the Opera, and John Owen-Jones new album Unmasked is due for release on 16th April. You can pre-order a copy here from Amazon for £7.97. I love him and can't wait for the CD but why do we have The Music of the Night,Bring Him Home and Hallelujah again?I hope at least they are new recordings.But the rest of it looks pretty good. At least those repeats could be classed as extras. Many cd albums these days only have 8 - 10 tracks & this has 14! It's bound to be good coming from John - he's a perfectionist. I am TOO excited for this. I agree with the above in that it is bound to be good! - Can't wait to see him in the Phantom Tour either!